Rawhide Safaris offers the finest bird hunting on the African continent comparable to the best anywhere in the world today, safari style. We have access to more than 100 000 hectare in different parts of South Africa for our shoots, which is mainly private land at large and not shared with other hunting groups while we hunt it. Wingshooting hunts are sustainable based, and these areas are only hunted every 4 weeks. 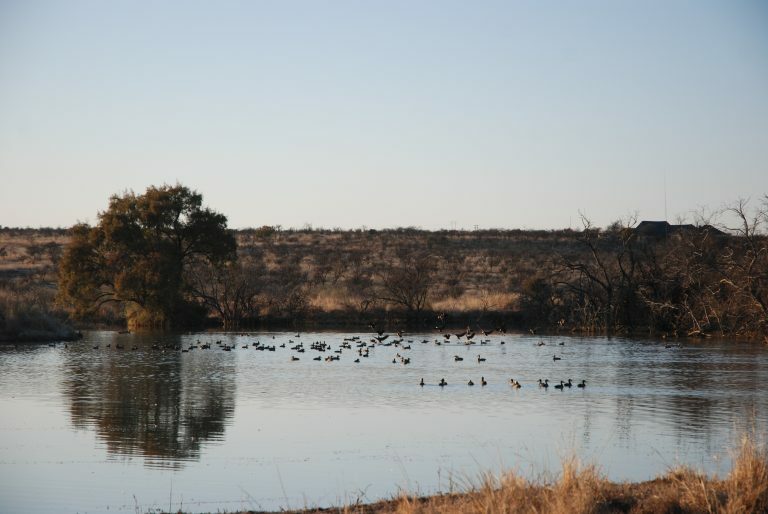 More than 90% of our wingshooting take place in the Free State province in the region of the Vaaldam, Vaal-, Vals, Wilger- and Renosterriver and other smaller streams. This area is also called the “grain barn” of South Africa, because so much grain is produced in this area. It is the ideal habitat for the upland birds, waterfowl, doves and pigeons, because there is more than enough cover, water, food and roosting places for them. We might not have such a high volume of birds like Argentina, but where in the world can you hunt so many different species of birds in one day other than with us in South Africa? Hunting/shooting wild birds like Guinea fowl and Rock pigeons are the ultimate wingshooting experience that every true bird hunter in the world wants to do. If you haven’t done it you will never know what it feels like to have the best of the best wingshooting experience. Twenty species of geese and ducks of which two are endemic occur here, 21 upland gamebird species as well as 14 dove species. Upland birds are subdivided in francolins (12 species), quails (3 species).Two (2) species of Guinea fowls and four (4) species of sandgrouse. he core emphases of our shoots are variety and quality rather than quantity and our motto is sustainable utilization as we try our utmost to live in harmony with our environment. All birds hunted are wild birds and not pen reared or released. Therefore, not all of the above mentioned birds are available for sustainable shooting. We regularly hunt approximately 15 – 20 of these species with success as they represent healthy and viable populations. Upland birds – guinea fowl and francolin are flushed out of long grass by walking up to them with trained dogs or flushed out of the corn fields or a driven hunt where by beaters driving the guinea fowl towards the shooters. Waterfowl – we will put you directly under the flight path in a hide or in natural cover, or we can also put you in a put blind in the cornfields were they feed. We also use decoys put strategically in the grain fields. 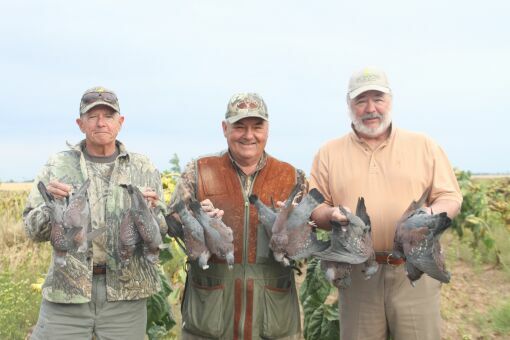 Doves & Pigeon – we will put you directly under the flight path in a hide or in natural cover near sunflower fields. Apart from dove and pigeon shooting where NO BAG LIMITS are applicable all other species are subjected to bag limits. Dove shoots can easily run into the 750 plus league daily, per shooter. If your shoulder and gun can stand it, be our guest. We cater for plainsgame hunting together with wingshooting. These combined hunts take place in one localized area and are exclusive regarding the amount of hunting days we have available to us and are quite popular due to the fact that little traveling takes place once we arrived. Antelope species available are Black Wildebeest, Red Hartebeest, Blesbuck (Common & White), Springbuck (Common, Black, White) Ostrich, Bontebok and Fallow Deer etc. 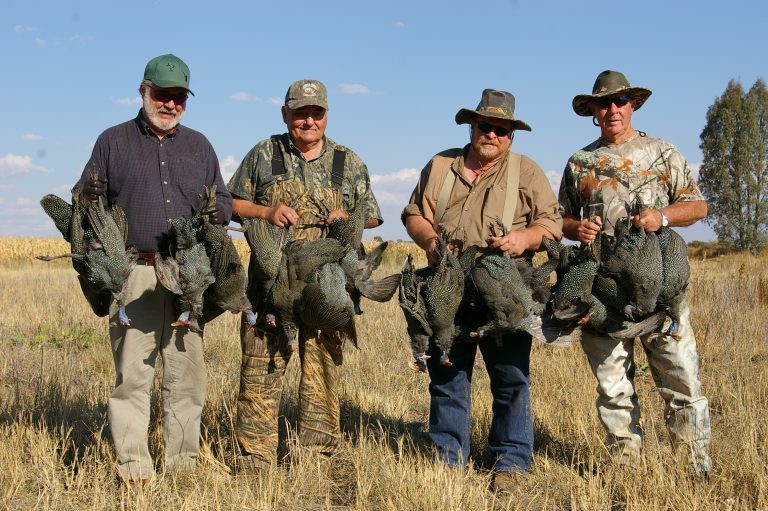 Our safaris are put together and taken care of by a team of dedicated people who have extensive experience of wingshooting. South Africa offer the true connoisseur unparalleled excitement in true African tradition. Meals are varied, and of ranch style cooking or western world style and consist of vegetables of the season, meat (mutton, beef, pork), poultry and fish. We cater for your specific wants and needs. Birds hunted can also be prepared. Supper normally is a 3-course meal. Beer, wines and spirits are all available from an open bar system. Specify your choice/s when booking on our questionnaire when completing it. Accommodation varies, from comfortable ranch style houses, with thatched roofs, tents, chalets to luxurious safari lodges. Normally double beds or twin single beds in room with flush toilet and hot shower facilities.